An African-American woman says the owner of a Virginia Dunkin' Donuts kicked her out of the store and called police when she accused the owner of racially profiling her. 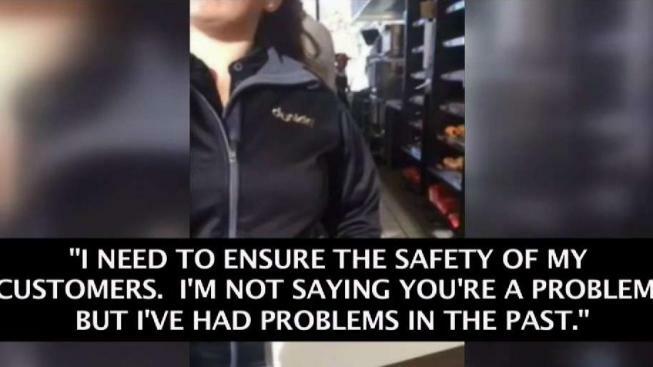 Tirza Wilbon White said she was at a Dunkin' Donuts in Fairfax using the free Wi-Fi when a white woman who identified herself as the owner of the store told her and another person of color they would have to buy something if they wanted to stay. "I was dressed in a hoodie, yoga pants, no makeup," White said. "I felt racially profiled." White then started recording video of her encounter with the owner. "I need to ensure safety to my customers and I'm not saying that you're a problem, but I've had problems in the past," the owner can be heard saying in the video. "I hadn't commited a crime. I wasn't yelling. I wasn't disruptive. I wasn't rude," White told News4. As the confrontation escalated, White accused the owner of singling her out because of her race. "Don't get into racial profiling. You can leave my location. I find that offensive," the woman says in the video. The owner then called the police. When White asks the officer why she has to leave he says, "because she wants you to." A spokesperson for Dunkin' Donuts Corporate told News4 the company apologized to White for the incident. "We and our franchisees want every customer who walks into a Dunkin' restaurant to be treated with dignity and respect. This did not happen in a situation at a restaurant in Fairfax, Virginia. We have apologized to the customer, but we know that is not enough," read the statement. News4's Mark Segraves went to the same restaurant on Thursday and sat in the store for more than 20 minutes using the Wi-Fi without being asked to leave. An employee at the store told Segraves he was not required to buy anything. However, a new sign in the store says that customers are required to buy something to sit inside. News4 has reached out to the store's owner for a response, but has not yet heard back.